Comparison of Steel vs Aluminum Trailer Wheels? Yes! We have a tire and wheel combo that uses the T13 wheel. It is # AM39046. The tire is an ST205/75R15 rated for 1,820 pounds at 50 psi. 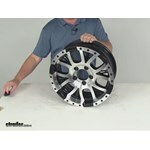 I have included a link to a video on this tire and wheel combo for you. If your trailer hubs have the standard 1/2 inch diameter thread the correct lug nut you'd want is the part # AM90054 which will fit and work well. These are a stainless acorn style. Great news! I can help. The Aluminum Sendel Wheel # AM22653 you purchased has a 3.19 inch pilot diameter which the Lionshead Stainless Steel Cap # LHCS102-SI60C would work great with. For a stainless steel with black cap I recommend the Americana Stainless Steel Center Cap # AM90175. I have linked the above mentioned products to this page for your convenience. The Aluminum Sendel Series T13 Machined Trailer Wheel - 15" x 6" Rim - 5 on 4-1/2 - Black # AM213565 is rated for 2150 lbs at 80 psi according to the manufacturer and the stamped back of the wheel. In another location on the back of the wheel it states 6 lugs and 2850 lbs. The 5 lug is indeed 2150 lbs max. You are correct. The capacity for all rims/tires on the trailer would be added together so if using four of the Americana Aluminum 7-Star Spoke Trailer Wheels, # AM22654, in your set-up, you would have a combined capacity of 11,320 lbs which would be sufficient for your 10,000 lb trailer. Keep in mind that you are always bound by the component in your towing set-up with the lowest capacity. If another component has a lower capacity than that of the wheels, you must not exceed that capacity. Yes, the Aluminum 7-Star Spoke Trailer Wheel # AM22654 is compatible with ST225/75R15 load range E trailer tires such as # AM10303. Both this wheel and the tire are rated for 2,830 pounds at 80 psi. For a valve stem use # AM20904. I have an option for you, but unfortunately we don't have the Aluminum Sendel Series T13 Machined Trailer Wheel - 15" x 6" Rim - 5 on 4-1/2 - Black # AM213565 in a 6 bolt pattern. 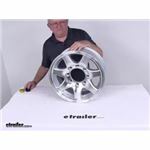 For the closest option from style perspective that will work, I recommend the Aluminum Viking Series Valhalla Trailer Wheel - 15" x 6" - 6 on 5-1/2 - Silver Spoke # AX02560655BMMFL. I've attached the page of all the options available to assist. The Americana 7-Spoke Aluminum 15 x 6 trailer wheel, part # AM22653 has a zero offset, which means that the mounting pad is equidistant from either side of the rim. The wheel has a 5 lug on 4-1/2 inch bolt pattern and a 3.19 inch pilot diameter. The load rating is 2830 lbs at 80 psi. I'd also recommend the # AM20904 valve stem, which is sold separately. If the spare tire on your trailer is positioned under the a-frame and subjected to the elements more so than normal I would actually go with the Aluminum Sendel Series T02 Machined Trailer Wheel part # AM22654 because as we know, aluminium cannot rust. Rust in regards to wheels can cause the bead seat to not seal properly which will result in leaks. Please note that the Sendel Series T02 Machined Trailer Wheel has a 6 on 5-1/2" bolt pattern with a 2,830 lb capacity. Like most trailer wheels the Aluminum Sendel Series # AM22654 that you referenced has a zero offset. I attached a help article for more info on this wheel for you to check out as well. Lug Nut torque for the Aluminum Trailer Wheel # AM22654 will be between 90 and 100 foot lbs torque based on the 1/2 x 20 wheel studs and 15 inch aluminum wheels. Because the wheel bolt holes are reinforced with the improved clamp force technology, I would torque them to 100 foot lbs and they will not need to be re-torqued regularly like other aluminum wheels due to that technology. I've attached a torque specification chart based on stud size, wheel size/type, and wheel material. 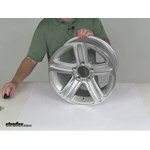 The Aluminum 7-Star Spoke Trailer Wheel # AM22654 that you referenced weighs 24 lbs. I attached a review video for this wheel for you to check out. I can almost guarantee the wheel would easily handle the 80 psi. Typically it's not the wheel though that is the limiting factor though. In most cases it's actually the valve stem. The best Load Range E tire we offer in the size ST225/75-15 is the part # LHWL304 which has the 80 psi rating. What I really like about this tire though is the speed rating of 75 mph and the 2 year roadside assistance program that comes with it. The Americana Aluminum 7-Star Spoke Trailer Wheel you referenced, # AM22654 as well as the rest of the 15 x 6, 6 lug alloy wheels we offer all have a 2830 lb weight capacity. This would be more than enough capacity for your 10000 lb capacity trailer. 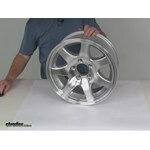 To see the wheels we offer in that size, click the provided link. The 14 inch wheels of your trailer would have the same bolt pattern as the Aluminum Sendel Series T02 Machined Trailer Wheel # AM22653 that you referenced. That means that these would bolt up to your trailer hub. If you went with a 205/75-15 sized tire for this rim like the # C20851D you'd gain about 1/2 an inch of tire height which wouldn't really be noticeable. If you went with a 225/75-15 like the part # C22515D instead you'd gain about 1-1/2 inches. I spoke to my contact at Americana to verify the max psi rating for the Americana Aluminum 7-Star Spoke Trailer Wheel # AM22654 and he informed me that it's max psi is 80 psi and has a weight rating of 2,830 lbs. Yes, we have the part # AM22662 which is the same style of wheel as the part # AM22653 except has a bolt pattern of 8 on 6-1/2 inch and has a diameter of 16 inch. 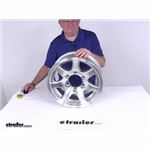 Yes, the Americana Aluminum 7-Star Spoke Trailer Wheel, item # AM22653, is a polished aluminum wheel. 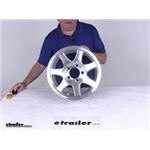 These wheels also have a clear coating to protect the finish.